On Tuesday a federal grand jury indicted a Philadelphia district attorney on charges related to a five-year stretch of corruption that saw Seth Williams, 50, accept thousands of dollars in bribe money, a trip to the Dominican Republic, and a 1997 Jaguar. 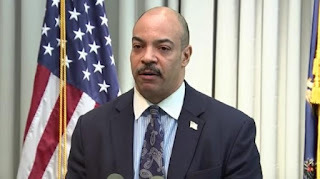 Seth Williams, who took office in 2010, was brought up on charges of bribery, extortion, honest services wire fraud, and defrauding a nursing home. Williams' lawyer told USA Today that Williams plans on fighting the charges. Philadelphia Mayor Jim Kenney spoke out about the case: "It is deeply shameful that the city’s chief law enforcement officer has been implicated in such a flagrant violation of the law," Kenney said. "At a time when our citizens’ trust in government is at an all-time low, it is disheartening to see yet another elected official give the public a reason not to trust us. That this comes at the head of our justice system is even more troubling. We must all greatly raise the bar for our behavior and show the citizens of Philadelphia that we are capable of carrying out our most basic responsibilities as elected officials, upholding the law."